Secluded Oasis of Luxury & Unparalleled Service Set in Papagayo Bay. Families, couples, or groups looking for the ultimate luxury resort experience by the beach. The renown Four Seasons Resort is Costa Rica’s most exclusive resort. Located in the sunny Peninsula of Papagayo, it’s the ideal choice for who want a well-rounded stay set along the golden sands of the Pacific. This world-class hotel has earned several awards and recogntions. Forbes Travel Guide has listed it as one of their 2018 Five-Star Rating hotel, and Condé Nast Traveler included it in their 2018 Gold List as one of the editors’ favorite hotels in the world. On-site activities. This includes canopy, sport fishing, snorkeling, hiking, and ball sports. State of the art golf course. The Arnold Palmer golf course is ranked among the 100 Best Outside the USA by Golf Digest. Personalized service. Attention to detail is key among staff, making for world-class service. Boutique feel. This is a large resort, with many visitors each year. Adult-only setting. Four Seasons has catered activities for children, teenagers, and adults. 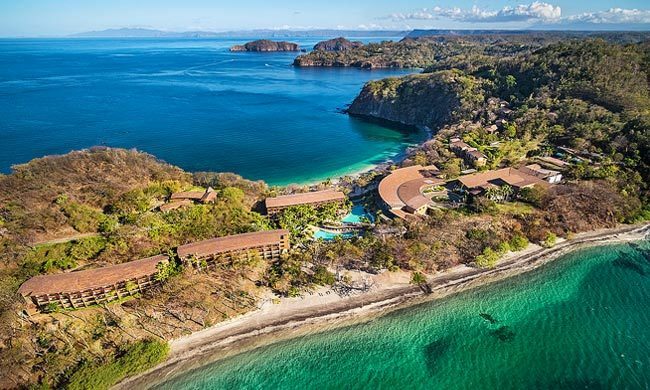 Located a 40-minute drive from Liberia’s international airport, the Four Seasons Resort Costa Rica is perched on a narrow section of Papagayo Gulf, in Guanacaste. This provides almost 180° views of the ocean and forest arround the property. Inspired by Costa Rican designs and art, each room, private balcony and patio features contemporary luxury with an authentic local feel. Nature, comfort, and service are placed upfront in this beautiful luxury hotel. Experience the meaning of true relaxation in the Four Seasons’ spacious rooms and residences et along 45 acres of beautiful tropical forest and golden-sand beaches. All rooms are the epitome of comfort and classic style blending with the elements through use of relaxing earth tones and natural materials.Their modern design has a flair of Costa Rica’s beaches that make it unique. With well-furnished spaces that emphasize peace and privacy, rooms are either within walking distance or a short golf cart ride away from the main facilities. Enjoy amazing views of the ocean, and a minibar with water and snacks which are replenished daily. If you want to take advantage of the great 24-hour room service, take your lunch or an afternoon snack at your patio surrounded by lush gardens. The resort is absolutely stunning. It has well-maintained grounds that seem to blend with the natural landscape that surrounds it. The property hosts a variety of locations and activities for guests to enjoy, regardless of age. Three swimming pools, two sandy beaches, a Kids Club, Teens Center, an indulgent spa, and a modern gym are only examples. Enjoy a day full of activities and fun while the younger ones get their own escapade as well. Finish a morning of exercise with delicious coconut water. The hotel also provides babysitting services and can accomodate pets with previous notice. However, what makes for a truly grat experience is the hotel’s service. With great attention to detail and an effort to place their experience first, guests can expect world-class attention during their stay. The Four Seasons Resort Costa Rica has a variety of complimentary activities to participate in each day, catering to all ages. If you like fine liqueur, make sure to not miss the rum tasting session. Sign up upon arrival and enjoy an informative and delicious event with infused flavors and chocolate. Take a short walk to one of the two nearby beaches for some water sports. The hotel provides equipment for all non-motorized water sports, so you can spend an afternoon kayaking, snorkeling, or stand up paddling. Due to its unique location in the gulf, the waters of the ocean are calm and provide the opportunity to see puffer fish, stingrays, and sea urchins. If you want something more relaxed, head there in the afternoon to watch the sunset. If you are a golf fan, there is no better place to be than the Four Seasons. With grounds designed by Arnold Palmer, the 18-hole golf course is one of the best and most beautiful in the country. Admire the spectacular views of both the beach and tropical forest as you play along. Golf carts even have computers to keep track of yardage and hole layout. The golf Club house also has a great selection of clothes and gifts to complement your experience. Test your abilities in an exceptional field while birds and monkeys sing around you. For nature lovers there is also plenty to do. Spot monkeys in the trees, and sunbathing iguanas on the ground. Watch out for coatis and raccoons as the run around in search of snacks. Be ready to hear numerous birds and to avoid stepping on hermit crabs as you go to the beach. If you want a more demanding feat, take the nature trail, with a 770-step climb that takes you up one of the lushest hills in the area. The Four Seasons has several on-site restaurants which showcase a variety of local and international cuisines. To avoid disappointment, we recommend you make reservations for dinner, especially during high season. Bahía Grill, or Bay Grill, is an all-day restaurant that offers Latin American flavors. Produce is organically sourced whenever possible, so you know the experience is as authentic as you can expect. For a different take, visit Pesce, which offers an Italian seafood kitchen. Dine with a panoramic view of the ocean, combining Mediterranian styles with Costa Rican’s touches. Caracol is the premier American Steakhouse of the hotel. This restaurant is a treat, as it overlooks the green scenery of the golf course. Sit either al fresco or indoors for some of the finest cuts in the country. Añejo, which means Old Timey, is a great spot to get snacks and eat healthily. Grab bowls and juices to invigorate your morning run, or stop by in the afternoon for a pre-dinner cocktail.